Seated hand in hand, we analyze our families contextual history through the tension that stems from being identical twins. As we are half-Spanish and half-Turkish, trilingual and tricultural, our collaboration is natural. 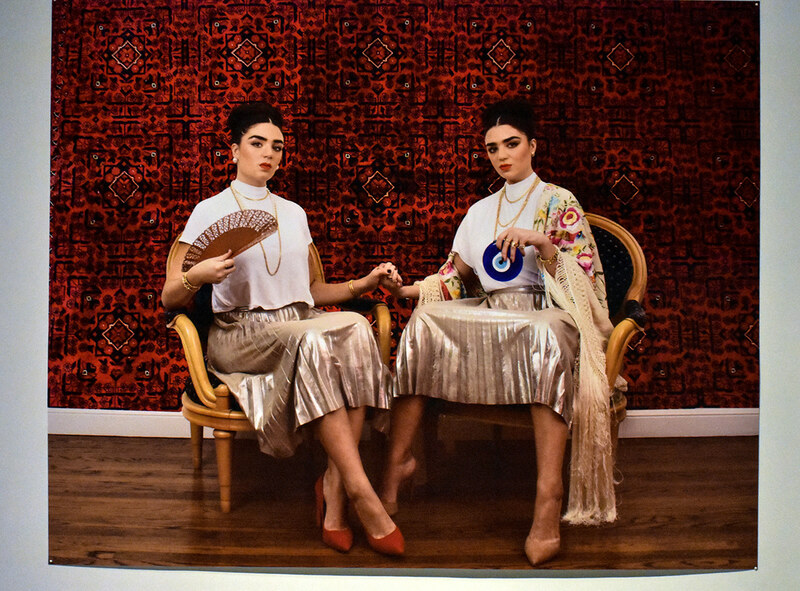 Inspired by Frida Kahlo’s work that also deals with a split heritage, this piece searches for identity within a background of disparate cultures. Adorned with accessories that pertain to my disparate heritage, Lara waves a Spanish abanico while Sofia dangles a Turkish nazar boncuk. The high-neck shirts and silver skirts convey an air of modernity that feels displaced, while the tone of space draws attention back to our origins. While we claim the equal right to our cultures and physically mirror each other, our nuanced poses reveal aspects of our relationship and distinct personalities.